Most current researchers and social scientists prefer quantitative data. Unlike qualitative data, quantitative data is easy to measure and analyze with a wide variety of analytical techniques. Moreover, most organizations require quantitative data for reports or reviews. However, despite these advantages, qualitative data can’t be ignored. Many times, qualitative data is the only option, such as for a nonprofit that does not have the budget for a rigorous quantitative study. Other times, qualitative data is the best option. Certain aspects are better conveyed through words and cannot directly be observed in numerical form. For example, studies on behavioral patterns, emotions, and cognitive sciences collect a lot of data that is purely qualitative. When you only have qualitative data, how can you quantify it for easier analysis or for organizational requirements? In this blog, we will discuss effective methods of quantifying qualitative data that will help you extract maximum benefit from subjective information. The Likert-type scale is a unidimensional (measures a single trait) method of measuring responses. It is a common tool in social surveys or questionnaires. On a Likert-type scale question, respondents indicate their level of agreement or disagreement with a particular statement or question using an ordinal scale (Harry N. Boone & Boone, 2012). Text and emoticon Likert-type scale questions on Collect. This methodology was developed by Dr. Rensis Likert from the University of Michigan. In 1932, his paper titled “A Technique for the Measurement of Attitudes” presented the idea of estimating mental attitudes in a “scientific” manner. His goal was to develop a way to measure attitudes akin to measuring length in meters and weight in grams. The most common Likert-type scale uses a 5-point response system: Strongly Disagree (1), Disagree (2), Neither Agree nor Disagree/Neutral (3), Agree (4), and Strongly Agree (5). The numerical code usually begins with 1 and generally has 1 value increments with each level. Some Likert-type scales (like the one below) use more points to give respondents a slightly wider palate of preferences or opinions to choose from. There is a crucial difference between Likert-type scales and Likert items. Technically, a Likert-type scale is the sum of responses to several Likert items. A Likert item is a single question in the Likert format. In a Likert-type scale question, the scores of individual Likert items are combined for data analysis purposes. This implies that the researcher is interested in the composite score, not necessarily the score on any given question. The above questions can be combined into a composite score on attitudes towards healthy eating. In this case, the summed scores of the 3 questions can be used directly in the analysis. Each question above is a Likert item on a scale of 1 to 5. The Likert-type scale is a sum of the entire survey, which would result in a scale of 3 to 15. For a survey of Likert items, the responses to the questions are not combined or summed into a comprehensive single scale. In these cases, the researcher uses the multiple questions to determine mutually exclusive interests; moreover the researcher is not looking to combine the score results. The example above is a survey of Likert items, not a Likert-type scale. The questions are unrelated and the researcher is interested in the individual scales for each question. Both the Likert-type scale and Likert item are questionnaire design mechanisms that facilitate easier collection and conversion of qualitative data. Collect both qualitative as well as quantitative data using our mobile data collection platform, Collect. Try it for free! Thematic analysis is a flexible, accessible tool that researchers use to quantify qualitative data. In surveys that solicit subjective answers from participants, the collected data is completely qualitative. In such situations, thematic analysis can be applied to find important or frequent themes from the data. In this context, a theme is something important about the data in relation to the research question, which represents some level of meaning within the data set. Familiarize yourself with the data: This requires repeated reading of the available data. It’s important to scrutinize the text in detail to ensure that you don’t overlook patterns or meanings. Note any patterns: After reading the data, make a list on the contents of the data and its salient features. All visible patterns or features should be taken into account. Search for themes: Once you’ve noted all potential patterns, look for possible ways to group them into themes. Review the themes: Look back at the data to check how valid your themes are. Be sure to check if sufficient data is available for each theme, if the themes are varied, and if the data within each theme is homogenous. If the observations under a single theme are too varied, the theme classification is not appropriate. Define and name themes: Now that your themes are set, define them clearly. At this stage, the list of themes should be a proper map of the information — the themes should describe the main points the respondents expressed in the surveys/questionnaires without overlapping in meaning. For example, don’t create a theme called “Educational Goals” and another theme called “Learning Aspirations”. The meanings are too similar. Analyze the data: Categorize individual words or phrases from the qualitative data into their appropriate themes. These themes can then be analyzed statistically. “Picture of Me” was a question in a survey given to students in a particular summer camp. The question asked these students to describe themselves in words. Their answers could cover anything from career ambitions to emotional or personal goals. Educational Goals and Skills: University; Sociology; Writing; Go to a university; Get good grades in GCSE; English; History; Mechanics; Design and technology; Geography; Physics; Computing; Spanish; Science; Biology; Maths; Chemistry; Photography courses; Art workshops; Creative subjects; Languages; Textile technology; Arabic; French. Work and Career Aspirations: Be a nurse; Fashion designer; Work with children; Have my own business; Medical care; Dentistry; R.A.F. maintenance engineer; Independent cartoonist; Pharmacist; Be a vet; Psychologist; Psychiatrist; Fashion modeling; Work in media; Product designer. Family and Friends: Family; Friends; Memories with cousins; Going out with family; Spending time with friends; Understand family better; Girlfriend; Looking after little sisters; Loyal to friends; Playing more with my brothers and sister. Extracurricular Interests: Games; Football; Volleyball; Movies; Rounders; Music; Hip hop; Cricket; TV shows; Computer games; Take photos; Dancing; Going to the park; Play video games; Going out; Telling stories; Illustration; Watch TV; Horse riding; Badminton; Social media; Motor biking; Concerts. Volunteering and Charity: Volunteering activities; Babysitting; Volunteering at animal shelter; Duke of Edinburgh charity; Charity volunteering; Volunteering in the library; Volunteering brownies; Fundraising for charities. Behavioral Aspirations: Loyalty; Confidence; Proactive; Be a good listener; Be responsive to feedback; Sympathetic; Honesty; Enthusiasm; Standing up for people; Be more patient; Organized; Communication; Be more determined; Confidence talking to people; Cheering up people; Staying positive and calm. Personal Goals: All around sports person; Visit a lot of countries; Go on a holiday every year; Live in Los Angeles; Live in Japan; Travel around the world; Religion; Fly around the world; Win an Oscar; Go to L.A. ; Own a horse; Travel by myself; Be a star; Explore different cultures. The data were grouped under 7 main themes, which emerged after careful scrutiny of the data. The themes were checked for internal homogeneity and external heterogeneity. Once this has been done, the number of words or phrases under each theme can be tallied and compared. In this case, descriptive statistics showed that the themes “Work and career aspirations” (36%) and “Extracurricular interests” (28%) showed up most in the data. Since previous questions of this form found that “Personal goals” and “Friends and family” were most common, this survey showed that the summer camp improved students’ interest in pursuing future career goals and extra-curricular interests. The scores gathered from this thematic analysis can also be used for more advanced computations, like correlating the use of different phrases or themes. Braun, V., and Clarke, V. (2006). Using thematic analysis in psychology. Qualitative Research in Psychology, pp:77-101. Guest, G., MacQueen, K. M., and Namey, E. E. (2011). Applied Thematic Analysis. New York: Sage Publications. Harry N. Boone, J., and Boone, D. A. (2012). Analyzing Likert Data. Journal of Extension. Want to know more about collecting high quality data? We’ve compiled our learnings on how to build a stellar data collection plan in our first ebook. 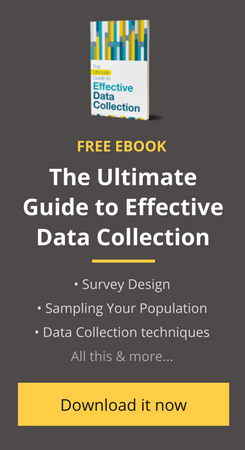 This 30-page guide contains everything you need to know, including an entire chapter dedicated to qualitative vs. quantitative research, to improve the way you collect data. Download now! Uttara Rajasekaran is an avid animal lover and has 3 cats and a dog. This Miranda House and LSE alumna is passionate about writing and wishes to put her math degree to good use by writing about analytical content. I admit this is picky, but having studied with Rensis Likert I think it’s important. A Likert scale is one which has been through Likert’s scaling procedure. A scale that is constructed with multiple options, as with those above, but has not used Likert’s scaling process is called a Likert-type scale. In fact, it really is questionable regarding results given that it really hasn’t been through any scaling process. So maybe another blog subject is to discuss scaling procedures, like Likert, Guttman, Thurstone, item analysis, item response, etc. I enjoy your site because it is simple and provides information regarding useful topics to people and organizations which are probably not very experienced in evaluation/research. You do, however, need to remember that sometimes trying to simplify things takes important considerations out of them. I totally agree with this comment that it’s easy to forget some of the background. I really like this site and often refer junior colleagues to it, bec there are often very simple ways of describing some of the basic methodologies that are used to start many project. But I do, like Brian, use Likert-type scale terminology all the time unless I’m truly doing scale development where I’d be calculating a total score based on many psychometric properties of variables other than face validity of why I put them in the same group on the same page within the same section of a survey. All in all, this site provides a lot of useful information, but simplifying some things misses key information. Perhaps more references to methodologic rationales for some activities might be useful. Hey Brian and Judy, thank you both for taking the time to flag this error! You’re completely right that we slipped up on the difference between Likert scales and Likert-type scales. I’ve fixed this in the blog, so hopefully it should be more accurate now. This appears to be all about selling this “socialcops” software, or whatever it is. Nothing was remarkable about this writing. It’s all stuff that is covered in a freshman psychology/sociology/statistics course. I agree with the commenter who asked “how do you know most researchers and social scientists prefer quantitative data?” We all have to be careful about making declarations without being able to back them up. A good or even just a competent, evaluator will be searching for the implications behind the qualitative data. Trying to see patterns, yes, but also trying to see the trees while looking at the forest. Hey Debra, thanks for the comment. I’m not sure what you were expecting, but we are a company. Yes, our content does help bring new people to our website, and some of them do start using our platform (http://blog.socialcops.com/other/socialcops-what-we-do). But that’s not why we write content. We write to help teach our partners about how to use data. We work with over 150 organizations, many of which have a pressing need to use data but very little knowledge about how to actually get and analyze data. Small nonprofits are a good example. We write many of our basic resources (a good example: http://ebook.socialcops.com/) for these partners, which is why they rightfully seem basic to you. But that’s what these partners — who haven’t been through freshman stats/psych/sociology courses – need. Separately, we also write more in-depth materials based on our field experience (like these: http://blog.socialcops.com/resources/create-an-effective-monitoring-and-evaluation-framework, http://blog.socialcops.com/resources/11-piloting-tips) or our engineering experiences (http://blog.socialcops.com/engineering/machine-learning-python, http://blog.socialcops.com/open-data/built-iot-devices-track-air-pollution-delhi). FYI we’ve replied to that commenter. We didn’t elaborate on that statement because it wasn’t the point of this article, but you and Kurt are right that it could have used a bit more support. All the best, and thanks again for the critical comment!